This product was added to our database on Monday 13 April 2015. "Air Force One" - or occasionally a similar call sign, such as "Executive One" - is the plane in which the President of the United States of America travels. In most cases the call sign of the President is associated with massive jet liners - at various times it has been a Douglas DC-4, a Douglas DC-6, a Boeing 707, and is now a Boeing 747. However the fleet of the top officials of the USA consists not only of transcontinental airliners, for domestic flights are flown by medium haul aircraft, and in some cases, flights over short distances are often served by small business jets. The Lockheed VC-140B Jetstar was one such plane during a long period. The Lockheed L-1329 Jetstar is a small business jet with four jet engines, which was created by the ingenious aircraft designer Kelly Johnson in 1957, and went into production in 1960. From the moment it emerged, the plane was positioned by its developers as a commercial business jet, however soon after it flew, the military became interested in it, as the Air Force needed (although only a few) small jet planes to undertake various tasks for the Transportation Command. In 1961 the Air Force purchased 16 aircraft of this type, which received the military designation C-140. Five machines were transferred to the Air Force Communication Command, the special division engaged in training of navigators and implementation of various delivery operations, and the other 11 machines came to the Military Airlift Command as auxiliary transport aircraft. Six of them were designated VC-140B and were delivered to the 89th Military Airlift Wing, a special division based at Andrews Air Force Base. Transportation of high officials including the President and Vice-president was always the principal task of the wing from its inception. One of the six VC-140Bs was, undoubtedly, the best known of any Lockheed Jetstar to be built. 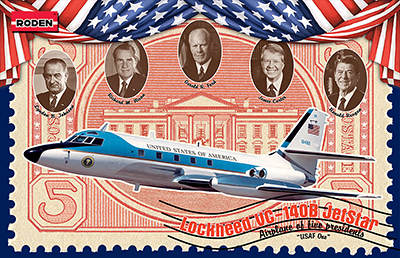 Lyndon Johnson, Richard Nixon, Gerald Ford, Jimmy Carter and Ronald Reagan were its VIP passengers from 1963 onwards. Every time when the President of the country sat down aboard VC-140B, for all air traffic controllers this plane received the radio call sign of "Air Force One". The VC-140B remained in service until 1989. After their long service one of them, which had served U.S. Presidents most often, was solemnly transferred from Andrews Air Force Base to the National Museum of the US Air Force at Wright-Patterson AFB in Dayton, Ohio.